In early 2015, we were lucky to be invited by the South Carolina State Museum to be included in a new exhibition called Carolina Makers. It showcased a range of locally-produced hand-made objects by Palmetto State artisans, from wearables to musical instruments, to furniture and more. 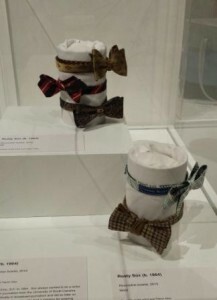 So, for more than a year, some of our favorite ties have been sitting under glass, on view for thousands of museum visitors from all over the world! The exhibition is now closed, Titanic Alley’s star bowties have come home, and now they are available on the web site. Follow the Shop Now link and look for the specially tagged Museum Collection ties. You can wear your very own museum artifact! 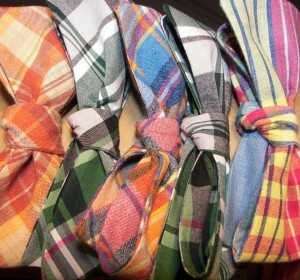 Also new to the site, lots of new ties with an eye toward great color for spring and summer! Easter is upon us, as are spring weddings, the charity gala season and Derby Day! All are great reasons to show up in a bright new summer bow. Have a look, and let Titanic Alley help you make a fresh impression this season.